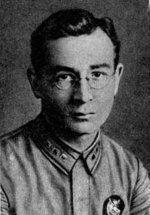 ww2dbasePavel Alexeyevich Rotmistrov joined the Red Army in 1919 and served during the Russian Civil War, the suppression of the Kronstadt Rebellion, and the Polish-Soviet War. In 1928, he began studying at the M. V. Frunze Military Academy in Moscow, Russia. Between 1937 and 1940, he was an instructor at the Moscow Higher Military Academy. In May 1941, he was named the Chief of Staff of the 3rd Mechanised Corps. Later named the commanding officer of the 5th Guards Tank Army, he saw action at the Battle of Kursk and during Operation Bagration; during his tenure with the 5th Guards Tank Army, he was promoted to the rank of colonel general in Oct 1943 and Marshal of Armored Troops in Feb 1944. In mid-1944, he became the deputy head of armored troops at the General Staff, which was considered a demotion from his prior field command. After the conclusion of the European War, he commanded Soviet mechanized troops in Germany, and later became a Deputy to the Supreme Soviet and the Assistant Minister of Defense of the Soviet Union. In 1962, he was named the Soviet Union's first Chief Marshal of Armored Troops. He retired from military service in 1968 and passed away in 1982. 6 Jul 1901 Pavel Rotmistrov was born in Skovorovo, Tver Governorate, Russia. 28 Apr 1962 Pavel Rotmistrov became the first Chief Marshal of Armored Troops of the Soviet Union. 6 Apr 1982 Pavel Rotmistrov passed away.